Couscous Pilaf, Thyme for Cooking easy, gourmet side dish for summer. You can leave the celery, onion and carrot raw for this pilaf, but I prefer it to be lightly sautéed. You could also put it with the couscous before adding the hot stock.... I like the flavor of sautéed. Chop carrot, celery and onion. Add carrot, celery, onion and sauté until crisp-tender, about 5 minutes. Remove from heat. 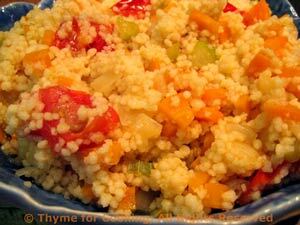 When couscous is ready, uncover, add vegetables, tomatoes, chives, fluff gently with a fork to combine and serve.